The makers of Hem-eez claim that this product is second to none. It is purported to strengthen capillaries, support cardio health, improve skin appearance, strengthen connective tissues, support blood circulation, improve cellular health, they even claim this product contains elements to fight cancer and lower cholesterol. Unfortunately, while researching this product, the company failed to provide an ingredient list or dosage amount. That is of great concern as a customer should always know what ingredients are in a given product. $39.95 for a bottle of 90 capsules. Hem-eez offers a 90 day money back guarantee, but did not list any particulars about the guarantee. 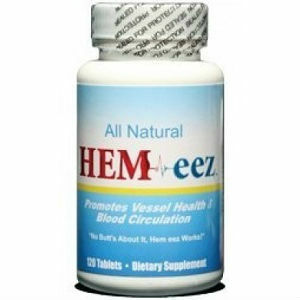 There is not a lot of information about Hem-eez and the ingredients it contains to perform these near miraculous claims of well-being. John Parker	reviewed Hem-eez	on October 22nd	 and gave it a rating of 3.